Hello dear friends, a very warm welcome to Simply Neutrals for October 2018! 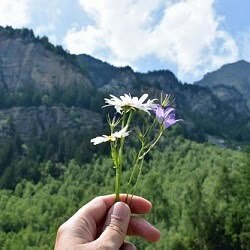 Thank you so much for your beautiful and heart warming link ups last month, I really feel this is a beautiful group of kind souls, encouraging each other and sharing our stories. Although I'm very busy with my illustration journey, I would not want to miss you sweeties! So I'm dedicated to keep this Simply Neutrals going for as long as possible. 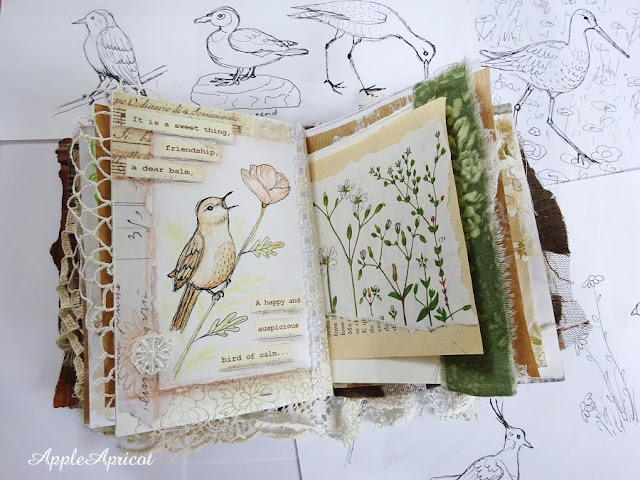 The monthly Simply Neutrals gathering is a good motivator for me to keep on working on my Forest mixed media journal, which is mostly neutrals with green here and there. For one of the projects for the illustration year course that I'm doing (and I will probably do another year in 2019!) I had to draw birds. If you know me, you know that I LOVE birds! So I don't mind drawing them, at all. Above you see my journal surrounded by some of the other birds I drew. In the (near) future I'd also love to embroider birds (and more flowers) in my journals, because besides drawing and painting and photography, embroidery is one of the things I'm passionate about. And besides illustration projects I'd love to go on with my exploring journey in textile and mixed media arts. Last month we welcomed Alison of alisonbomber.blogspot.com to our gathering. A very warm welcome to you, Alison! I was enchanted by the gorgeous nature themed tags she created. There is so much texture and layering going on on these small canvases. I love that she added dried flowers too. It's the 49th SNT already! Next month will be the 50th party, a jubilee one! And I will have a little surprise for you then! But for now, let's focus on this month, shall we? My dear Wen , first thank you so much for your lovely email, you will soon hear from me friend. And then your adorable, beautiful spread- I sooo love your bird, the sweetest little singer, and so lovely on the flower in soft pink. 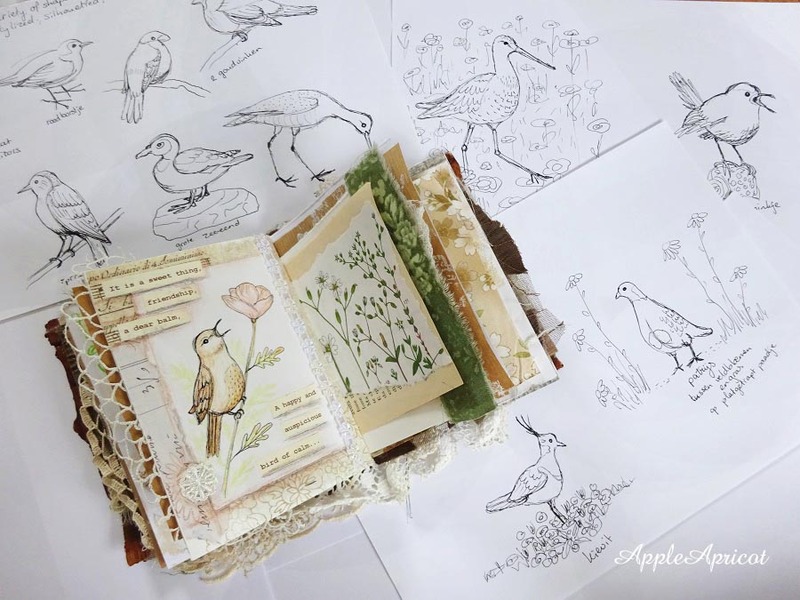 All your birds are so nature-like and and could deserve a place in your gorgeous art journal Wen . 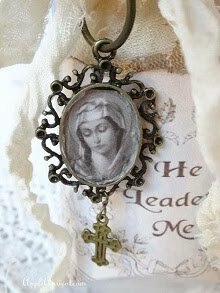 And yes so lovely to see Alison here last months, I`m a guest on her blog, every time there is a new post, and love her art ! I can hardly believe another month has gone by~ Your forest Journal is looking beautiful! as ever~ The delightful bird and his merry sentiment are a true testimony to friendship <3 Really enjoyed all your art-work details on the page. Your talent is a gift, your drawings gorgeous~ Thanks for sharing. Hello... Such a lovely journal. I don't usually link up but I enjoy visiting those that do! Have a blessed day. 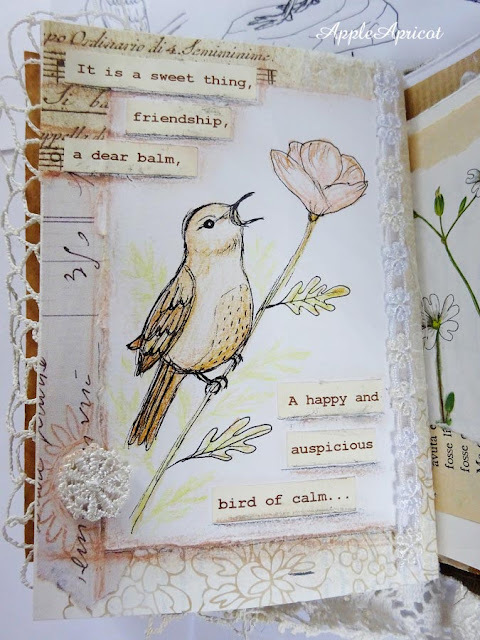 Oh my your journal is just gorgeous, love your sweet birds, you do a wonderful job with them. Alison made some gorgeous nature tags too! Your Forest mixed media journal looks just gorgeous with your hand drawn little bird- not to mention all the other little birds you have been drawing as part of your illustration year course. Looks wonderful and would so love to see more pages here! Thanks for sharing this and also showing Alison's beautifully stamped and textured tags! Sending you lots of hugs as you go into Autumn! Such a beautiful little book Wen! I love your drawings/sketches! Thank you so much - I'm delighted and honoured to be featured, and I'll wear my badge with pride! I'm away from home and most of my craft supplies for most of this month, but I hope I'll be back to join in again nonetheless. I was so busy being grateful that I forgot to say how charming your journalling page is. The bird is just lovely, and he and the words go so well together. I also love those grasses on the opposite page with the book page and other textured pages behind - letting us know there are more treats in store if we turn over. Your wee bird drawing is charming - I can just about hear him/hear singing! Oh Wen! Hello again, your book spread is so original with your own drawing, and the words are sweet too. You must be happy to see the results of your drawing course happening. I love those earthy forest tones you have chosen, especially that dash of green fabric. You inspire me to try something like this, too. I would also like to try eco dyeing of paper and fabric too. I love the way it sets off a nature theme. 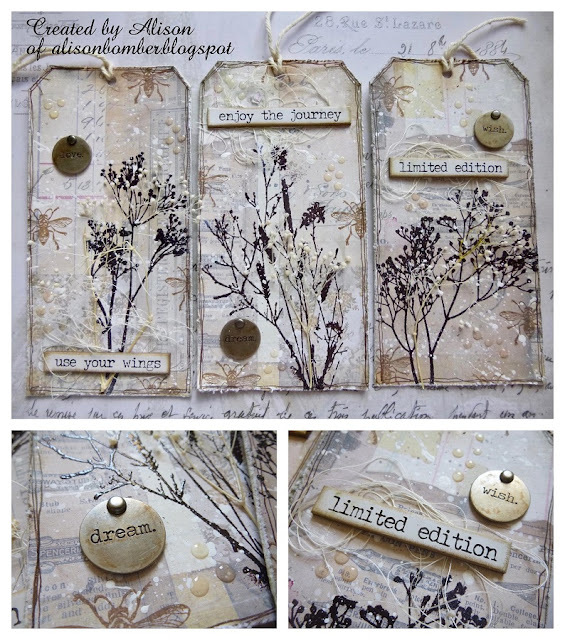 Alison's tags are exquisite too, with their interesting textural elements and great sentiments. I must check out her blog too. I haven't done as much creating as I'd like, so I am trying to get a few things out of my way to start doing more. 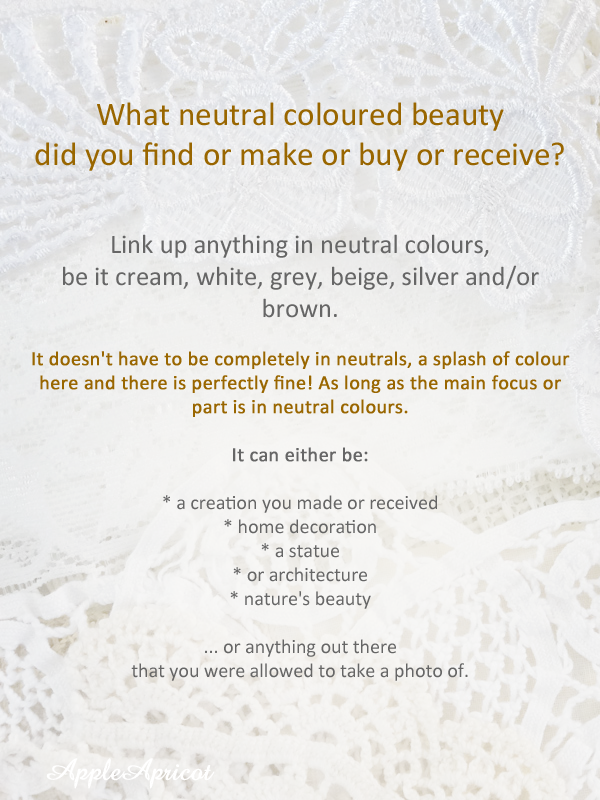 Thanks for hosting Simply Neutrals again - it really is a positive little haven of caring artistic souls. I'm so looking forward to our 50th! Your forest journal is just so beautiful and I love Alison's tags so much! Hello wen, so happy to be linking up again:) Your book is so beautiful and I really love the theme! Alison's tags are gorgeous inspiration too. Thanks for hosting!